I make tacos in my crock pot often but I have never made beef tacos in it before. Well, I have been missing out! What was supposed to be a pot roast dinner ended up being a taco dinner! This is the one time where I am actually glad that I forgot to buy the veggies for my pot roast. My forgetfulness really paid off! 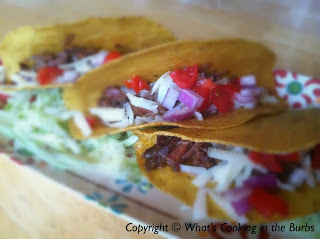 These tacos were fantastic and the chipotle peppers added a nice spicy kick to them. I am definitely making these again and soon! Spray the bottom of your crock pot with cooking spray. Season the meat with chili powder, garlic, and cumin. Add meat to your crock pot add pour in your beef broth and top with chipotle peppers. Cover and cook on low for 8-9 hours or until meat is tender. Shred with a fork and spoon into taco shells. Top with cheese and an additional toppings of your choice. Enjoy! cooking in a crock pot is the way to go. looks great, i'll need to make this soon. I hope Tyler/Bandwidth does make your tacos. I've got my Crockpot ready! Thank you for adding your recipe to Foodie Friday! We love tacos, but I had never thought of making them in the slow cooker. You have inspired me! Visiting from Spatulas on Parade. Just what I was looking for!!! We are very busy right now, so I'm cooking in my crock-pot all the time. My family LOVES their taco's so this is just perfect! I'm going to give it a try this week :) Thanks!! Thanks for sharing at Swap N Share Sunday! I love that this awesome recipe is cooked in the Crock Pot, that makes it better. Thank you very much for sharing with Full Plate Thursday and have a great week!